We demonstrate how to identify and isolate 6 subsets of myeloid progenitors from murine bone marrow using a combination of magnetic and fluorescence sorting (MACS and FACS). This protocol can be used for in vitro culture assays (methylcellulose or liquid cultures), in vivo adoptive transfer experiments, and RNA/protein analyses. Yáñez, A., Goodridge, H. S. Identification and Isolation of Oligopotent and Lineage-committed Myeloid Progenitors from Mouse Bone Marrow. J. Vis. Exp. (137), e58061, doi:10.3791/58061 (2018). Myeloid progenitors that yield neutrophils, monocytes and dendritic cells (DCs) can be identified in and isolated from the bone marrow of mice for hematological and immunological analyses. For example, studies of the cellular and molecular properties of myeloid progenitor populations can reveal mechanisms underlying leukemic transformation, or demonstrate how the immune system responds to pathogen exposure. Previously described flow cytometry strategies for myeloid progenitor identification have enabled significant advances in many fields, but the fractions they identify are very heterogeneous. The most commonly used gating strategies define bone marrow fractions that are enriched for the desired populations, but also contain large numbers of "contaminating" progenitors. Our recent studies have resolved much of this heterogeneity, and the protocol we present here permits the isolation of 6 subpopulations of oligopotent and lineage-committed myeloid progenitors from 2 previously described bone marrow fractions. The protocol describes 3 stages: 1) isolation of bone marrow cells, 2) enrichment for hematopoietic progenitors by magnetic-activated cell sorting (lineage depletion by MACS), and 3) identification of myeloid progenitor subsets by flow cytometry (including fluorescence-activated cell sorting, FACS, if desired). This approach permits progenitor quantification and isolation for a variety of in vitro and in vivo applications, and has already yielded novel insight into pathways and mechanisms of neutrophil, monocyte, and DC differentiation. Monocytes, neutrophils, and dendritic cells (DCs) are myeloid cells that arise from hematopoietic progenitors, primarily in the bone marrow, by a process called myelopoiesis. Common myeloid progenitors (CMPs) have the potential to produce myeloid cells, as well as megakaryocytes and erythrocytes, but not lymphoid cells. Granulocyte-monocyte progenitors (GMPs), which are derived from CMPs, produce granulocytes and monocytes, but have lost megakaryocyte and erythrocyte potential. Monocytes and classical and plasmacytoid DCs (cDCs/pDCs) are also thought to arise from common progenitors known as monocyte-DC progenitors (MDPs), which are produced by CMPs. 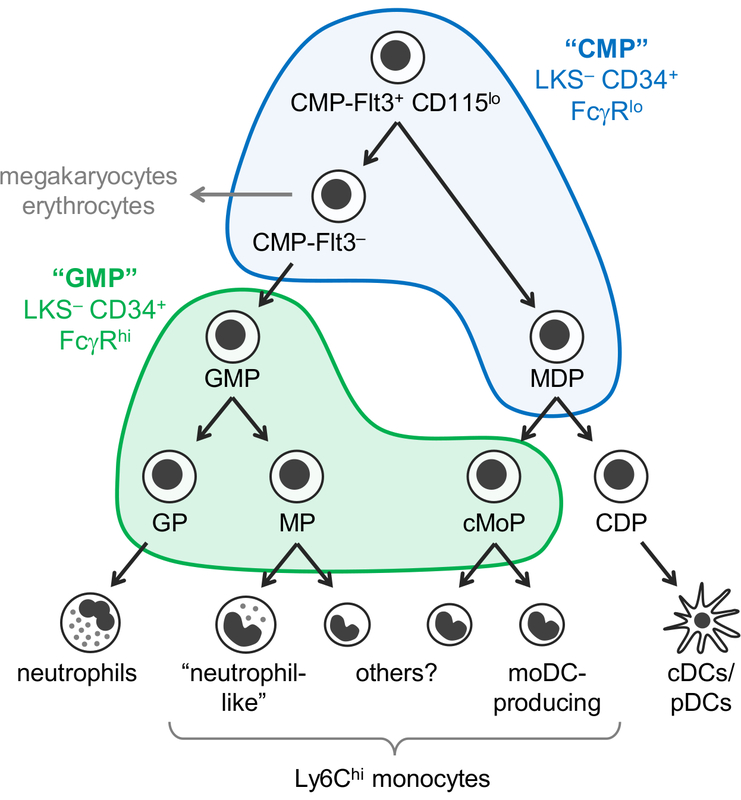 Gradual restriction of lineage potential ultimately results in lineage-committed progenitors: granulocyte progenitors, monocyte progenitors, and dendritic cell progenitors (Figure 1). Weissman and colleagues reported that CMPs are found in the Lin- c-Kit+ Sca-1- (LKS-) CD34+ FcγRlo fraction of mouse bone marrow, while GMPs are contained in the LKS- CD34+ FcγRhi fraction1. However, these "CMP" and "GMP" fractions are very heterogeneous. For instance, the "GMP" fraction also contains lineage-committed granulocyte progenitors and monocyte progenitors1,2. MDPs were separately reported to be CX3CR1+ Flt3+ CD115+ progenitors that also express CD34 and FcγR3,4. MDPs give rise to cDC/pDC-producing common DC progenitors (CDPs), which have been reported to express lower levels of c-Kit (CD117) and are not included in the LKS- fraction5. It was previously assumed that monocytes arise via a single pathway (CMP-GMP-MDP-monocyte). Consistent with this model, monocyte-committed progenitors produced by GMPs (named monocyte progenitors, MPs)2 and MDPs (named common monocyte progenitors, cMoPs)6 appear to be the same cells on the basis of shared surface marker expression. However, we recently demonstrated that monocytes are produced independently by GMPs and MDPs, and were able to distinguish between MPs and cMoPs by single-cell RNA sequencing7. We recently modified the Weissman "CMP" and "GMP" gating strategy to identify 6 subfractions of C57BL/6J mouse bone marrow containing different oligopotent and lineage-committed myeloid progenitor subsets. We first reported that staining for Ly6C and CD115 permits the isolation of oligopotent GMPs, as well as granulocyte progenitors (GPs) and monocyte progenitors (both MPs and cMoPs, which we are currently unable to separate) from the "GMP" fraction2 (LKS- CD34+ FcγRhi gate; Figure 1). We subsequently demonstrated that MDPs are predominantly found in the "CMP" fraction (LKS- CD34+ FcγRlo gate), which also contains Flt3+ CD115lo and Flt3- subsets7 (Figure 1). The CMP-Flt3+ CD115lo fraction yields both GMPs and MDPs upon adoptive transfer. The CMP-Flt3- subset contains progenitors that appear to be intermediates between CMP-Flt3+ CD115lo cells and GMPs. Unlike MDPs, both the CMP-Flt3+ CD115lo and CMP-Flt3- fractions also possess megakaryocyte and erythrocyte potential. It is important to note, however, that it is currently unclear whether the "CMP" fractions contain progenitors that are truly oligopotent (e.g., individual cells within the CMP-Flt3+ CD115lo fraction that possess neutrophil, monocyte, DC, megakaryocyte, and erythrocyte potential), or alternatively, comprise a mixture of progenitors with more restricted lineage potential. Colony forming assays (methylcellulose cultures) revealed cells with granulocyte (neutrophil), erythrocyte, monocyte and megakaryocyte potential (GEMM cells) in the "CMP", CMP-Flt3+ CD115lo and CMP-Flt3- fractions1,7, but do not permit the assessment of DC potential. In contrast, colony forming assays demonstrated the existence of oligopotent GMPs (progenitors with both neutrophil and monocyte potential) in the "GMP" fraction1,2, and this is supported by recent single-cell transcriptomic analysis8. It is not currently known, however, whether these oligopotent GMPs also produce other granulocytes (eosinophils, basophils, and mast cells). Based on these studies, we now demonstrate how 7 surface markers (c-Kit, Sca-1, CD34, FcγR, Flt3, Ly6C and CD115) can be used to identify and isolate these 6 subsets of oligopotent and lineage-committed myeloid progenitors. The protocol described here can be applied for in vitro culture assays (methylcellulose or liquid cultures), in vivo adoptive transfer experiments in mice, and molecular analysis (bulk and single-cell RNA sequencing, Western blotting, etc.). The protocol consists of 3 stages: 1) preparation of a single cell suspension of bone marrow cells, 2) enrichment for hematopoietic progenitors (magnetic-activated cell sorting), and 3) identification, and isolation if desired, of progenitor subsets by flow cytometry (using an analyzer or a sorter, as appropriate). The first step is the isolation of bone marrow cells from the femurs and tibias of euthanized mice and is similar to other previously described protocols9. Next, the sample is enriched for stem and progenitor cells using a cocktail of antibodies against cell surface markers of erythrocytes, neutrophils, monocytes, lymphocytes, etc., to deplete the differentiated cells. This is not mandatory, but strongly recommended to optimize detection of the progenitor subsets, and to reduce the quantity of antibodies needed for progenitor identification and the time required for flow cytometry. The lineage depletion protocol below describes Magnetic-Activated Cell Sorting (MACS) using a Mouse Lineage Cell Depletion Kit (which contains biotinylated antibodies against CD5, CD45R (B220), CD11b, Gr-1 (Ly6G/C), 7-4, and Ter-119, plus anti-biotin microbeads) and an automated magnetic separator. The final step is the identification (and sorting, if desired) of the progenitor subsets by flow cytometry. The antibody panel described below (see also Table 1) has been designed to be used in a flow cytometer (analyzer or sorter) with 4 lasers (405 nm, 488 nm, 561 nm, 640 nm). Figure 1: Neutrophil, monocyte and DC progenitors and differentiation pathways. The recently revised model of myelopoiesis7 is illustrated, with the Weissman gates for "CMPs" (blue) and "GMPs" (green)1 overlaid. This figure has been modified from Yáñez et al. 20177. Please click here to view a larger version of this figure. All methods described here were approved by the Institutional Animal Care and Use Committee (IACUC) of Cedars-Sinai Medical Center. Euthanize the mouse in accordance with institutional guidelines. Place the euthanized mouse on its back and spray it with 70% ethanol (EtOH). Make a small (3 - 5 mm) incision in each hind limb at the ankle level using sharp, pointed scissors, and pull the skin up towards the body to remove it from the legs and expose the muscles and bones. Remove the muscles (quadriceps, hamstrings, etc.) from the bones by trimming them with scissors, following the direction of the bone. Be careful not to damage the bones. Dislocate the femurs from the hip joints and cut away the connective tissue and muscle to detach the legs, being careful not to cut into the bones. Remove the feet by dislocating the ankles from the tibias, place the bones in a tube of sterile PBS or media, and transport them on ice to the tissue culture room. NOTE: For some other applications (e.g., deriving macrophages from total bone marrow cells) it is possible to leave the bones on ice for a while, but for progenitor isolation it is important to proceed as quickly as possible to avoid downregulation of important surface markers (especially CD115). In a biosafety cabinet, remove any remaining soft tissue from the bones by rubbing them with tissue paper. Note: The protocol should be performed in a biosafety cabinet if a sterile sample is required for cell culture or in vivo assays after FACS sorting. If sterile cells are not required, the whole process can be performed on the lab bench. Briefly immerse the bones in 70% EtOH to disinfect them, and then in sterile PBS to wash them. Separate the femurs from the tibias and fibulas by cutting through the knee, and discard the fibulas. Cut the ends off of the bones with sharp scissors. Grip each bone with forceps, and insert a 26G needle connected to a 10 mL syringe containing cold sterile PBS into the bone shaft at one end. Hold the bone above a 50 mL centrifuge tube and flush 2 - 5 mL PBS through the bone to harvest the marrow. Harvest the marrow from all 4 bones per mouse (2 femurs and 2 tibias). Gently pipette up and down with a 1 mL pipette to disaggregate the bone marrow to form a cell suspension. Filter the bone marrow suspension through a piece of 30 μm nylon mesh to eliminate bone pieces and cell aggregates, thereby generating a single cell suspension. Centrifuge the single cell suspension at 280 x g for 5 min, and resuspend the cell pellet in sterile staining buffer (PBS + 0.5% FBS + 2 mM EDTA), using 5 mL staining buffer per mouse (e.g., 10 mL for cells pooled from the femurs and tibias of 2 mice). Take a 10 μL aliquot of the sample, mix it with 10 μL Trypan Blue, and load 10 μL of the resulting Trypan Blue-labeled sample on to a hemocytometer. Count the cells using a light microscope. NOTE: If the cells are too concentrated for reliable counting, dilute the sample prior to adding Trypan Blue. Centrifuge the entire single cell suspension (or as many cells as are required to obtain the desired yield) at 280 x g for 5 min at 4°C and resuspend the cell pellet in 40 μL staining buffer (PBS + 0.5% FBS + 2 mM EDTA) per 107 cells. NOTE: It is also possible to use MACS buffer from the lineage depletion kit manufacturer (see Table of Materials) as an alternative to the staining buffer. Perform the lineage depletion according to the instructions supplied with the lineage depletion kit. The following instructions are for the kit seen in the Table of Materials. If a different kit is used, follow the manufacturer's instructions and then proceed to step 2.3. Add 10 μL biotin-antibody cocktail per 107 cells, mix by pipetting and incubate for 10 min at 4 °C. Add 30 μL staining buffer/MACS buffer per 107 cells and mix. Add 20 μL anti-biotin microbeads per 107 cells. Mix well and incubate for an additional 15 min at 4 °C. NOTE: Vortex the microbeads before adding them to the cells to make sure that they are completely dispersed. Add 1 mL staining buffer/MACS buffer per 107 cells, centrifuge the cells at 280 x g for 5 min, and resuspend the cell pellet in 500 μL staining buffer/MACS buffer for up to 108 cells. For more than 108 cells, scale up the volume of staining buffer/MACS buffer accordingly. Prepare the automated magnetic separator according to the manufacturer's instructions. Place the tube containing the labeled cells into the separator and choose the negative selection program. Collect the negative fraction, which contains the progenitor-enriched lineage-negative (Lin-) cells. Discard the positive fraction, which contains the magnetically-labeled lineage-positive cells. Centrifuge the Lin- cells at 280 x g for 5 min, and resuspend the cell pellet in 2 mL staining buffer/MACS buffer per mouse (e.g., 4 mL if bone marrow was pooled from 2 mice). Note: The pellet should now be white instead of red because the erythrocytes have been depleted. Take a 10 μL aliquot of the Lin- cells, mix it with 10 μL Trypan Blue, and load 10 μL of the resulting Trypan Blue-labeled sample on to a hemocytometer. Count the cells using a light microscope. Label 9 microcentrifuge (1.5 or 2 mL) tubes for: 1) unstained cells, 2-8) cells single stained with fluorophore-conjugated antibodies against FcγR (CD16/32), c-Kit, Sca-1, CD34, Flt3 (CD135), Ly6C and CD115 for voltage selection and color compensation, and 9) sample cells to be stained with all 7 antibodies for progenitor identification and sorting. Distribute 100,000 cells to each of the control tubes (tubes 1 - 8), and all the remaining cells (or fewer if desired) to the sample tube (tube 9). NOTE: If the sample volume is greater than 1.5 - 2 mL, it may be necessary to distribute the sample cells into a 15 mL tube, centrifuge them and resuspend the pellet (step 3.3 below), and then transfer the cells to a microcentrifuge tube for the subsequent staining steps. Centrifuge the cells at 1,500 x g for 5 min, and resuspend the control tube pellets in 100 μL staining buffer (PBS + 0.5% FBS + 2 mM EDTA) and the sample tube pellet in 100 μL staining buffer per 5 x 106 cells (e.g., 200 μL for 1 x 107 cells). Add 2 μg/mL anti-CD16/CD32-APC-Cy7 to the FcγR single stain tube and the sample tube. Vortex gently to mix, and incubate for 10 min at 4 °C. NOTE: It is important to stain the sample cells with the FcγR (CD16/32) antibody prior to adding the other antibodies to prevent competition due to non-specific Fc-mediated antibody binding. Do not incubate the cells with an FcγR blocking reagent. Add the other antibodies to the corresponding single stain tubes (1 antibody each) and the sample tube (all 6 antibodies): 10 μg/mL c-Kit-Pacific Blue, 2 μg/mL Sca-1-PE-Cy7, 25 μg/mL CD34-FITC, 10 μg/mL Flt3-APC, 2 μg/mL Ly6C-PerCP-Cy5.5, and 4 μg/mL CD115-PE. Vortex gently, and incubate for 15 min at 4 °C. Add 900 μL staining buffer to the control tubes, and 1 mL staining buffer per 107 cells to the sample tube. Centrifuge the cells at 1,500 x g for 5 min and resuspend the cell pellet in staining buffer: 200 μL per control tube, and 500 μL per 25 x 106 cells in the sample tube. Transfer the resuspended cells to 5 mL FACS tubes. NOTE: If the sample volume is greater than 1.5 - 2 mL, it may be necessary to transfer the cells to a 15 mL tube for centrifugation. Prepare the flow cytometer (analyzer or sorter) according to the manufacturer's instructions. Run the unstained and single stained control cells through the flow cytometer to set up the voltages and color compensations. Run the sample cells, gate the progenitor subsets as outlined below and summarized in Figure 2, and if desired, perform FACS sorting to isolate the relevant progenitor subsets. NOTE: It is typically necessary to acquire approximately 200,000 cells to obtain at least 1,000 events in each progenitor gate. Create a dot plot of all cells, displaying FSC-A (x-axis) and SSC-A (y-axis), and gate to exclude debris and dead cells => "live" cells. Create a dot plot of "live" cells, displaying FSC-H (x-axis) and FSC-W (y-axis), and gate to exclude doublets => live/singlet (FSC) gate. Create a dot plot of live/singlet (FSC) cells, displaying SSC-H (x-axis) and SSC-W (y-axis), and gate to exclude doublets => live/singlet (FSC)/singlet (SSC) gate. Create a dot plot of live/singlet (FSC)/singlet (SSC) cells, displaying Sca-1 (x-axis) and c-Kit (y-axis), and gate to select c-Kit+ Sca-1- cells => LKS- cells. Create a dot plot of LKS- cells, displaying CD34 (x-axis) and FcγR (y-axis), and gate to select CD34+ FcγRlo cells => "CMPs", and CD34+ FcγRhi cells => "GMPs". Note: It’s important to gate the “CMPs” and “GMPs” as precisely as possible. It’s helpful to use a pseudocolor density plot or a contour plot for accurate gating. Flt3+ CD115hi cells => MDPs. Create a dot plot of "GMPs", displaying Ly6C (x-axis) and FcγR (y-axis), and gate to select Ly6C-cells => "GMP-Ly6C- cells", and Ly6C+ cells => "GMP-Ly6C+ cells". Flt3- CD115lo cells => GMPs. Flt3- CD115hi cells => MPs+cMoPs. Using the protocol described above, it is possible to obtain ~100 million cells (including red blood cells, or ~50 million nucleated cells) from both femurs and tibias (2 legs) of one C57BL/6J mouse (6 - 8 weeks old, male or female). 1 - 2 million Lin- cells can be isolated per mouse by MACS depletion of Lin+ cells. Each of the 6 myeloid progenitor subsets constitutes ~1 - 4% of the Lin- cells. Lineage depletion is efficient at depleting differentiated cells and enriching for progenitors, but the Lin- fraction contains a large proportion of c-Kit- cells in addition to c-Kit+ progenitors (Figure 3A). Progenitor yields after FACS sorting can vary depending on the sorter settings used (e.g., maximum yield versus optimal purity), but in general it is possible to obtain 10,000 - 40,000 cells per fraction (Figure 3B). Post-sort flow cytometry analysis should reveal >95% purity of each fraction (Figure 3C). Figure 2: Gating strategy for the identification of the 6 myeloid progenitor fractions. 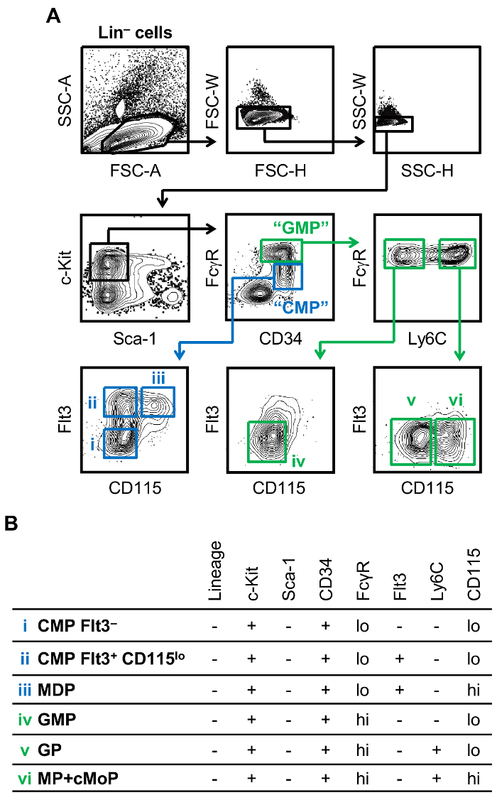 (A) Progressive gating of the live Lin- cells -> singlets (FSC) -> singlets (SSC) -> LKS- cells -> CD34+ FcγRlo ("CMP") and CD34+ FcγRhi ("GMP") fractions -> 6 myeloid progenitor subsets. (B) Summary of surface marker expression by the 6 progenitor fractions. Please click here to view a larger version of this figure. Figure 3: Representative progenitor yields and purity. (A) Representative flow cytometry plots showing c-Kit and CD11b expression by bone marrow cells before and after lineage depletion, demonstrating enrichment of progenitors (c-Kit+ cells). (B) Cell yields for each progenitor fraction, presented as mean + standard deviation of 30 experiments. Bone marrow cells from up to 20 mice were pooled for each experiment. (C) Representative flow cytometry plots from post-sort analysis, demonstrating the purity of FACS-sorted progenitor fractions. Panel C has been modified from Yáñez et al. 20177. Please click here to view a larger version of this figure. Table 1: Antibody panel and flow cytometer configuration. The Weissman gating strategy for mouse myeloid progenitor identification1 has been the gold standard for immunologists and hematologists for nearly 20 years, but it is now apparent that the "CMP" and "GMP" gates are very heterogeneous and more precise gating strategies are needed. The protocol that we have described here permits the identification of oligopotent and lineage-committed subsets in C57BL/6J mice for more precise quantification of specific myeloid progenitors and mapping of myelopoiesis pathways, as well as investigation of molecular mechanisms operating at specific stages of myeloid differentiation. The progenitor subsets can be sorted, if desired, for molecular analyses, in vitro and in vivo assessment of differentiation etc. The protocol was developed using young (6 - 8 weeks old) C57BL/6J mice and is suitable for both male and female mice. We have not characterized the progenitor subsets in older mice. We don't anticipate the markers will change with age, but the relative proportions of the subsets may vary. We have not assessed the progenitor subsets in other mouse strains. The first application of our modified gating strategy was to provide mechanistic insight into the regulation of myeloid cell fate choice by the transcription factor interferon regulatory factor 8 (IRF8)2. IRF8 was previously reported to be expressed by GMPs (the Weissman "GMP" fraction) and required for monocyte differentiation by promoting monocyte gene expression, suppressing neutrophil gene expression, and promoting neutrophil apoptosis10. Using our modified gating strategy, we demonstrated that IRF8 is not expressed by oligopotent GMPs, but is expressed by both GPs and MPs+cMoPs2. Moreover, we demonstrated that IRF8 regulates GP and MP+cMoP survival and differentiation, rather than production of the lineage-committed progenitors by oligopotent GMPs. Similarly, we recently used our modified gating strategy to re-define the model of myelopoiesis, and demonstrated that GMPs and MDPs produce functionally distinct inflammatory monocytes via 2 independent pathways7. The lineage depletion step can be performed using a manual magnetic separator instead of an automated magnetic separator, and lineage depletion can also be achieved by flow cytometry using the biotinylated lineage marker antibody cocktail and a fluorophore-conjugated anti-biotin antibody, with gating to select the unstained cells. Lineage depletion excludes most differentiated cells and enriches for c-Kit+ progenitors to minimize the time and costs associated with the subsequent steps (i.e., reduces antibody volumes for flow cytometry, analyzer/sorter time, etc.). Investigators should refer to the manufacturer's datasheet to determine whether the lineage depletion step worked as efficiently as anticipated for the specific kit used. However, it doesn't matter if lineage depletion is not 100% efficient because differentiated (Lin+) cells don't express c-Kit, so any differentiated cells remaining after lineage depletion (as well as other c-Kit- cells) are subsequently excluded by flow cytometry gating. It is also important to note that GPs and MPs express Ly6C but, unlike the Ly6C expressed by monocytes, the progenitor Ly6C (presumably a different isoform) is not detected by the Gr-1 antibody often included in lineage depletion kits, and thus GPs and MPs remain after lineage depletion2. Good staining is important for all the surface markers, but particularly critical for FcγR to permit accurate gating of the FcγRlo "CMPs" and the FcγRhi "GMPs". Optimal fluorophore choice and antibody dilution are essential for good separation, and an FcγR blocking reagent (commonly used prior to staining for flow cytometry) must not be used. It is also important to note that CD115 is downregulated when the cells are maintained at 4°C or on ice for extended periods, so it is important to work quickly to obtain good staining. We recommend processing the cells within 1 - 2 hours to preserve their integrity. If live cells are not required, stained cells can be fixed and acquired within 48 hours. One limitation of the current protocol is that it does not permit separate identification of MPs and cMoPs, which complicates evaluation of these progenitors, investigation of their gene expression and functional properties, etc. For example, an observed increase in MP+cMoP numbers does not indicate whether enhanced monocyte production occurs via the GMP pathway, the MDP pathway, or both. In ongoing studies, we hope to identify surface markers that distinguish between MPs and cMoPs. In the meantime, evaluation of these progenitors by single-cell RNA sequencing7 could be used to profile the relative proportions of MPs and cMoPs. Single-cell RNA sequencing studies will likely also reveal additional heterogeneity within the 6 progenitor fractions described in this protocol, some of which will reflect different maturation states e.g., GPs that have only recently lost monocyte potential versus GPs that are poised to proceed to the next stage of differentiation. The "GMP" fraction subsets may also contain progenitors with the potential to produce other granulocytes (eosinophils, basophils, and mast cells), but we have not investigated this. As noted in the Introduction, it is also currently unclear whether the CMP-Flt3+ CD115lo, CMP-Flt3- and MDP fractions truly contain the predicted oligopotent progenitors or alternatively comprise a mixture of progenitors with more limited lineage potential, but single-cell RNA sequencing may provide insight into this important question. A new approach is now required for the identification of subsets of human myeloid progenitors. Weissman and colleagues previously defined myeloid subsets (including "CMPs" and "GMPs") in human bone marrow and cord blood11, but they are similarly heterogeneous. Unfortunately, translation of mouse gating strategies to human progenitors is complicated by notable differences in surface marker expression between human and mouse progenitors; e.g., CD34 expression is limited to myeloid progenitor subsets in the mouse, but more broadly observed on human progenitors including hematopoietic stem cells. Single-cell RNA sequencing studies should, however, also permit the identification of candidate markers to separate the human progenitor subsets. This protocol was developed using funds from the Board of Governors Regenerative Medicine Institute at Cedars-Sinai Medical Center (to HSG), a Careers in Immunology fellowship from the American Association of Immunologists (to AY and HSG), and a Scholar Award from the American Society of Hematology (to AY). We thank the Flow Cytometry Core at Cedars-Sinai Medical Center for assistance with FACS sorting. Akashi, K., Traver, D., Miyamoto, T., Weissman, I. L. A clonogenic common myeloid progenitor that gives rise to all myeloid lineages. Nature. 404, (6774), 193-197 (2000). Yáñez, A., Ng, M. Y., Hassanzadeh-Kiabi, N., Goodridge, H. S. IRF8 acts in lineage-committed rather than oligopotent progenitors to control neutrophil vs monocyte production. Blood. 125, (9), 1452-1459 (2015). Auffray, C., et al. CX3CR1+ CD115+ CD135+ common macrophage/DC precursors and the role of CX3CR1 in their response to inflammation. Journal of Experimental Medicine. 206, (3), 595-606 (2009). Fogg, D. K., et al. A clonogenic bone marrow progenitor specific for macrophages and dendritic cells. Science. 311, (5757), 83-87 (2006). Onai, N., et al. Identification of clonogenic common Flt3+M-CSFR+ plasmacytoid and conventional dendritic cell progenitors in mouse bone marrow. Nature Immunology. 8, (11), 1207-1216 (2007). Hettinger, J., et al. Origin of monocytes and macrophages in a committed progenitor. Nature Immunology. 14, (8), 821-830 (2013). Yáñez, A., et al. Granulocyte-monocyte progenitors and monocyte-dendritic cell progenitors independently produce functionally distinct monocytes. Immunity. 47, (5), 890-902 (2017). Olsson, A., et al. Single-cell analysis of mixed-lineage states leading to a binary cell fate choice. Nature. 537, (7622), 698-702 (2016). Amend, S. R., Valkenburg, K. C., Pienta, K. J. Murine hind limb long bone dissection and bone marrow isolation. Journal of Visualized Experiments. (110), (2016). Yáñez, A., Goodridge, H. S. Interferon regulatory factor 8 and the regulation of neutrophil, monocyte, and dendritic cell production. Current Opinion in Hematology. 23, (1), 11-17 (2016). Manz, M. G., Miyamoto, T., Akashi, K., Weissman, I. L. Prospective isolation of human clonogenic common myeloid progenitors. Proceedings of the National Academy of Sciences of the United States of America. 99, (18), 11872-11877 (2002).